And in a Catch-22, these politicians rigged the election system to keep themselves in power. Then afterwards, when they're done screwing us over while "serving" in government office, they go to work as corporate lobbyists to screw us over even more. Now, because of stagnant wages over the last several decades (because are "job creators" are so cheap and greedy), both of the Social Security trust funds have been under-funded; while those who reaped most of the wealth, have escaped paying their fair share of taxes. And despite all the evidence we have of income inequality, our crumbling infrastructure, our bankrupt cities, and the overall general decline of our nation — these same politicians continue to make a very dire situation for most Americans even worse. That's why regular working people (on both the left and the right) are getting so fed up — and why people such as Bernie Sanders and Donald Trump have had such great public appeal; because they know we're fed up. These politicians ... they run, they lose, they win ... all they do is run. They don’t lose anything, they help themselves." But for their own best interests and the interests of those that bought them (their biggest campaign donors, etc. ), our politicians just continue to give the American people cheap lip service without ever getting anything meaningful accomplished. Just the opposite: Our "hope and change" president wanted fast-track to pass more bad trade deals. Can anyone blame most Americans for being fed up? Companies are tightening their belts, with fewer perks and fringe benefits. An inadvertently leaked report showed that staff economists at the Federal Reserve are more pessimistic about the near future than the official Fed positions. And big companies with nowhere else to put their piles of cash are buying back their stock or buying up competitors, which means fewer well-paying management jobs. Yet hardly any of these reports citing official sources and economic data connect the dots to outline what’s behind this unwelcome trend in the US: government policies. Governments are helping big industries by diminishing competition, providing abundant cheap credit for speculation rather than investment, and failing to rein in price gouging. In turn, these policies produce a growing concentration of income and wealth at the top while the vast majority struggle with falling wages, flat incomes, job insecurity and a shrinking slice of investment assets. In our new age of inequality—the top 10 percent now own nearly 80 percent of all wealth ... A trust is empowered to carry out the last wishes of the deceased [such as leaving their wealth to someone in an inheritance]. Trusts have been once governed by something called the Rule Against Perpetuities, which places a roughly 100-year limit on how long they can exist. This prevents people with no connection to the living world from putting restrictions on our country’s wealth. But in recent years, the safeguard of time has been eroded ... We are experiencing a rapid rise of "dynasty trusts". To take advantage of a change made to the tax code in the 1980s, states started to radically diminish ( or outright remove) the rule against perpetuities in the 1990s. This resulted in a race to the bottom, with states competing to see which could most effectively restructure their laws to benefit the rich. By 2003, states weakening these rules received an estimated $100 billion in additional trust business. Now, 28 states allow trusts to live indefinitely, or nearly so, creating what are called " perpetual dynasty trusts". Dynasty trusts can also avoid taxes for the term of the trust. A generous multimillion-dollar tax exemption for trusts that skip a generation can be leveraged aggressively. And since the eventual death of the trust isn’t built in, a dynasty trust can buy houses and assets that are retained for descendants, tax-free, by the trust indefinitely. The wealthy can tie up their money, outside of any public obligation or scrutiny, forever. Trusts aren’t the only way in which the dead will exercise more control in the future. A 1998 law extended copyright and patent protections far beyond the life of individual creators, and the Trans-Pacific Partnership trade agreement is set to extend that system overseas. Jeb Bush is basing his entire campaign on increasing economic growth, with the implicit assumption that the rising tide will lift all boats. If only the rich benefit from that rising tide, his entire economic rationale falls apart. People trying to debunk this chart are using "average" rather than "median" wage compensation, which is like taking the average salary of five workers in a room when one of them is Bill Gates. The "average" salary will look pretty robust, even if the other four workers in that room are being paid the minimum wage. Wages remained stagnant for the bottom 80 percent of workers, even if you include non-wage benefits [such as healthcare and Social Security]. Just like the difference between average and median compensation, the gap between the CPI [consumer price index] and the overall inflation rate is also indicative of a problem in the economy. If productivity gains just leak out to the wealthy through financial engineering, all the growth in the world won’t benefit the typical worker. This is why conservatives are desperate to debunk this chart, because it upends their entire conception of low taxes on the wealthy and deregulation as the key to prosperity for all. U.S. wages and benefits grew in the spring at the slowest pace in 33 years, stark evidence that stronger hiring isn't lifting paychecks much for most Americans ... The slowdown suggests that companies are still able to find the workers they need without boosting pay. 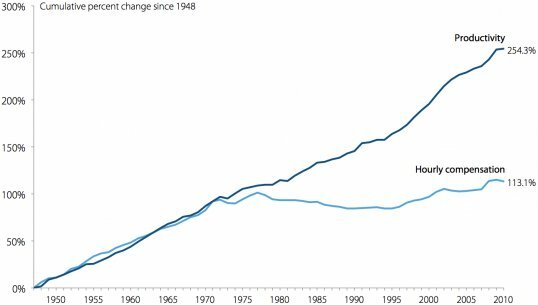 Since 1970, the real wages of US production workers have stagnated, despite the rapid growth in output per worker. This apparent disconnect between labor productivity and real wages is most dramatic when real output per hour is contrasted with real average hourly wages since 1970. In short, the economy has seen a sharp upward redistribution of income over the last three decades with little obvious growth dividend. Policies that redistribute income upward, yet fail to increase growth, are very costly to the vast majority of the U.S. labor force. A new study finds that the best way to get ahead is to be born there. Surveys find that nearly two-thirds of Americans [very foolishly] believe that it’s still possible to start out poor in this country, work hard and become rich, while also discounting the value of family background and connections in achieving success. Wage growth is the key to the program's solvency for two reasons. The first is that the upward redistribution of wage income over the last three decades has played a large role in the projected shortfall. As income has been transferred from ordinary workers to those at the top of the wage distribution, a larger share of wage income has escaped taxation. When the Greenspan Commission set the cap for taxable wages in 1983, it covered 90 percent of wage income. Currently the cap only covers around 82 percent of wage income. If the cap had continued to cover 90 percent of wage income, the projected shortfall would be roughly 40 percent less than it is now. The other reason why broadly based wage growth is key to the program's continuing solvency is that the burden of possible future tax increases would be much less consequential if most workers will share in the gains of economic growth. The Social Security trustees have projected that real wages will rise by more than 34 percent over the next two decades. (They are projected to rise by another 30 percent over the following two decades.) Even if the payroll tax is increased by three percentage points, it would take back less than one-tenth of the projected rise in before-tax wages if wage growth is evenly shared. On the other hand, if most of the gains from growth continue to go to those at the top end of the distribution, any tax increase will be a major burden. As an aside: Rep. Becerra introduced legislation that would combine the Social Security Old Age and Disability Trust funds. Such a move would improve their solvency and ensure that America’s disabled workers and retirees can continue to receive their earned benefits well into the future. According to the 2015 Social Security Trustees report, the SSDI trust fund would no longer be able to pay full benefits in 2016 unless Congress takes action. Becerra’s bill would ensure that both remain solvent through 2033. Editors' note: Of course, that's a little like robbing Peter to pay Paul. That's why the "cap" for Social Security taxes should be completely scraped (eliminated) and capital gains should also be taxed for Social Security, because all the new low-wage jobs and stagnant wages can't properly fund Social Security for the disabled and retirees — those who worked so hard to make the rich so rich to begin with. As a second aside: Representative Mike Honda (CA) is introducing legislation that will require Social Security Cost of Living Adjustments (COLAs) to be based on the Consumer Price Index for the Elderly (CPI-E). This index more accurately reflects the actual cost of living for older Americans which can sometimes be higher because seniors spend more on housing and health care than the general population. Editors' note: President Obama and other "Third Way" Democrats were willing to use chain-CPI for Social Security COLAs, reducing benefits for the disabled and retirees. But people such as Senators Bernie Sanders and Elizabeth Warren were against this — and they also want to raise the "cap" to EXPAND Social Security benefits. * More info is at the Alliance for Retired Americans Legislative Conference 2015, where Senator Bernie Sanders (video) and House Minority Leader Rep. Nancy Pelosi (video) both spoke. It doesn't appear as though any Republicans were there. A minimum wage of $15 an hour for employees at fast-food chains should come by 2018 in New York City — and by 2021 in the rest of the state. Another measure to raise the minimum wage to $15 per hour is also slated to appear on the ballot in 2016 in Washington D.C. — raising the minimum wage just like they have in Seattle, San Francisco and Los Angeles — and soon New York. But as usual, business groups are threatening job layoffs, automation to replace workers, and closing businesses. But not one single CEO said they might have to buy a smaller yacht or one less beachfront mansion — and they never say the won't be able to afford to buy out another company (or merge) with another multi-billion-dollar deal, just because they pay their employees too much. And most of our government leaders will continue to appease and kow-tow to the super-rich, because they don't have the fortitude, the integrity and the moral character to regulate greed. So most Americans will have no choice but to be even more fed up ... until one day, when they eventually storm the ramparts with torches and pitchforks. Labor costs in the United States recorded their smallest increase in 33 years during the second quarter as workers were paid less in commissions and bonuses. Just as the phrase 'Greed is Good' has followed us for years, in the current environment the plunging stock market, the carnage in other markets, the pain of stagnant wages...it is all good because it leads to pain. Pain is good, because it is the bodies way of saying - hey, you know what you were doing just there? It hurts...STOP DOING IT!!! When enough Americans feel that pain in their bones, THEN we will have change. Becuase the People will demand no less. Either that, or have their skulls clubbed in by the thugs of the Police State, depending on how far we have truly descended into authoritarianism. We shall see. Don't tase me, bro. Just give me a fair wage, a fair market, and a fair & level playing field. Anything else, and those oligarchic cronies & politicians better start getting used to a whiff of tear gas in the mornings. Maybe even some woodchippers. The minimum wage is something that they use to distract people from the real issue. What good is a "minimum wage" when they are attacking and manipulating the job market to destroy the best jobs that should be occurring naturally? Outsourcing (unfair arbitrage against job market), insourcing L1/L2/H1 etc., importing illegals to dilute working class vote/take jobs, etc. Then the most obvious one that Americans are too stupid to see: At the first sign that the job market is overcoming all of the efforts to sabotage wages, the Fed immediately raises rates to destroy any chance of that happening. Right in front of you! They talk about stopping "wage inflation" on national TV every day! - Makes you wonder if Americans aren't in exactly the mess they deserve to be in. Since the 1970's wages did not stagnate for the vast majority because growth in productivity, income and wealth creation collapsed. Productivity still managed to rise substantially in recent decades, but essentially none of this productivity growth flowed into the paychecks of typical American workers. Pay failed to track productivity primarily due to more wage and salary income accumulating at the very top of the pay scale and the shift in the share of overall national income went to owners of capital and away from the pay of employees. Income generated in an average hour of work in the U.S. economy has not trickled down to raise hourly pay for typical workers. Since 1973, hourly compensation of the vast majority of American workers has not risen in line with economy-wide productivity. In fact, hourly compensation has almost stopped rising at all. If the hourly pay of typical American workers had kept pace with productivity growth since the 1970s, then there would have been no rise in income inequality during that period. The economic evidence indicates that the rising gap between productivity and pay for the vast majority likely has nothing to do with any stagnation in the typical worker’s individual productivity. * A former member of the Fed was on Fox News the other day and had said "increased productivity" and "tax cuts" were very important for "growth" — and that more growth would best resolve the matter of "wealth redistribution" and "income inequality". But isn't that called "trickle-down economics" — when a rising tide is supposed to lift all boats? And isn't that what we've had for the past 35 years — all while wages have remained stagnant? And didn't we have any "growth" during that time when the DOW went from 950 in Sept. 1980 to over 16,000 in Sept. 2015? "Most workers have failed to see improvements in their paychecks. In fact, taking into account cost-of-living increases since the recession officially ended in 2009, wages have actually declined for most U.S. workers. Inflation-adjusted or “real” wages reflect workers’ true purchasing power; as real wages decline, so too does the amount of goods and services workers can buy with those wages. The failure of wages to merely keep pace with the cost of living is not a recent phenomenon. The declines in real wages since the Great Recession continue a decades-long trend of wage stagnation for workers in the United States."